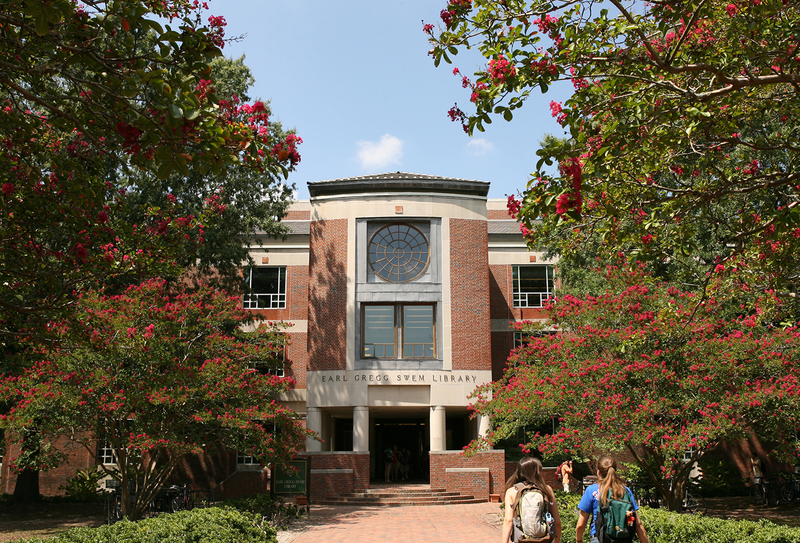 Individuals can now receive borrowing privileges at W&M Libraries at no cost, and likewise, W&M students, faculty and staff can receive library privileges at Williamsburg Regional Library (seen here), including those who do not live in Williamsburg, James City County or York County. In celebration of National Library Week, William & Mary Libraries and Williamsburg Regional Library (WRL) announce a unique partnership that will significantly benefit local residents and the W&M community by expanding access to library resources. With community interests at the core of the agreement, both institutions aspire to increase access to library collections, develop collaborative programming and support community goals for lifelong learning. “I am excited by the opportunity to expand our relationship with W&M Libraries and to work with Carrie Cooper, who is an enthusiastic and forward-thinking collaborative leader,” said WRL Director Betsy Fowler. Cooper, dean of university libraries at W&M, is a strong advocate for dismantling barriers to access to library resources, and sees this partnership as a part of that strategy. A key element of the partnership is its reciprocal borrowing privileges agreement, which provides unprecedented access to the collections at both library systems. Individuals can now receive borrowing privileges at W&M Libraries at no cost, and likewise, W&M students, faculty and staff can receive library privileges at WRL with their W&M ID, including those who do not live in Williamsburg, James City County or York County. “I’m excited to open our library collections to the community, but, even more so, I’m delighted that our W&M community – especially those who live outside the city and counties – will be able to take advantage of WRL’s collections in a way they have never been able to before,” said Cooper. Often, public libraries only issue library cards to individuals who live in the city or county in which the library is located, since residents fund the libraries through taxes. This is often a dilemma for higher education students, staff and faculty who commute from other areas or live in the area temporarily. Now, however, W&M faculty, staff and students (with a valid W&M ID) can receive an enhanced privileges WRL card regardless of their home address. As a cardholder, W&M affiliates can borrow books, access online collections, download digital resources such as e-books and more. “I believe our W&M community will especially enjoy access to more popular titles and leisure reading material available at WRL,” said Lisa Nickel, associate dean of research and public services at W&M and member of the team that developed the partnership. Local residents can now borrow books from Swem Library (pictured) at no cost. For local residents, the chief barrier to accessing library resources at W&M was a $100 fee to obtain a visitor account. Although low compared to peer libraries, it dissuaded community members from taking full advantage of the libraries’ resources. However, the new agreement grants WRL card holders the ability to borrow books from W&M’s research quality collections, use library spaces and attend programs and events – all at no cost. W&M Libraries and WRL will also be working together on a variety of projects to include community programming and ILL service expansion. “It’s unique for an academic library and a public library to partner in this way, but we saw how mutually beneficial this partnership could be, with opportunities to collaborate on programming, training, collection access and more. I’m looking forward to seeing how our partnership grows in the future,” said Nickel. For more information, visit W&M Libraries at libraries.wm.edu or WRL at www.wrl.org.